My favorite food! Top five anyway. And last night we had some. 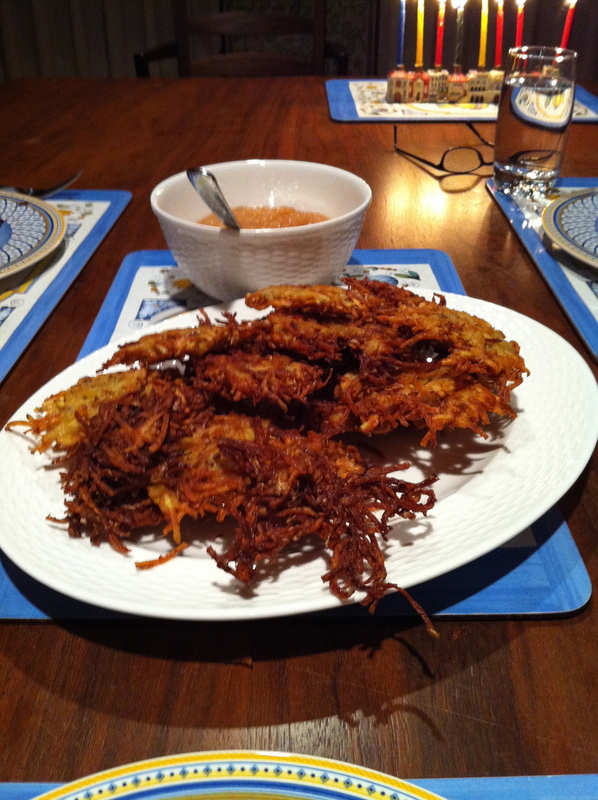 Gail figured out years ago how to make near perfect potato latkes. Not the flour-filled blobs most restaurants serve, but crisp ones. And I was the fortunate beneficiary most Chanukahs — maybe two out of three or at least one out of two. But it’s been awhile. Our last happy latkes dinner was five years ago. Chanukah came late that year, starting after Christmas. We celebrated Chanukah and the new year jointly with a New Year’s Day latkes dinner, we being Gail, me, Joel, and Joel’s friend Dmitry. Joel was home following his first semester at college; Dmitry was back from a fall in South America. This year, like that year, we waited until the seventh night of Chanukah for our feast. Accompanying the latkes was apple sauce made by our brother-in-law Jim. Latkes. Apple sauce. What else do you need? A perfect dinner. The miracle of oil.